This month's book blurb is for a book I waited 2 years before gathering up the courage to pick it up from the bookstore because of boredom. And hell yeah, every single peso was worth it. I've been an avid follower of the Shadowhunter chronicles (I call it that), ever since Clockwork Angel. 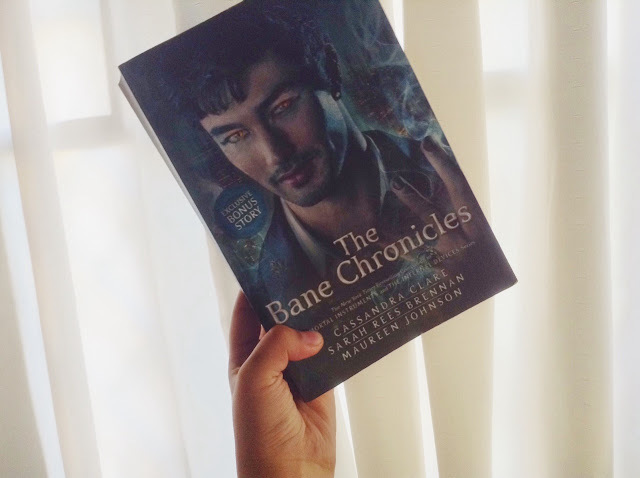 It was the first Cassie Clare book I have ever read and in that book alone, I've already loved the character of Magnus Bane, who is the central character for this collection or compilation of short stories about his life of about a hundred (or thousand?) of years. Following Cassie on twitter and tumblr was a way to get a glimpse of her books, even if they were still in the making. And while most of the snippets and fan answers I see from her social media reassure me that this book is going to be graced with everyone's beloved Magnus Bane sass, the book itself was still full of delightful surprises. It did not only tell Magnus's sides of the story in the two serieses, TID and TMI. His life before and between these timelines were also told. Another delightful thing about these stories is its discussion of the supporting characters' lives and point of views. My favorite, particularly, is Raphael Santiago's story. It is good to note that The Bane Chronicles did not only discuss Magnus's life. It also discussed in avid details the lives and the point of views of those around him: Catarina Loss, Ragnor Fell, and Camille Belcourt, etc, while they all proved to be interesting characters just by reading TMI and TID, have proved themselves to be so much more in these series of shorts. While we cross paths once again the familiar faces from TMI and TID in this collection, we also get to meet new faces-- most of which have been introduced to us via tumblr and twitter, as the headlining characters for The Last Hours, the series of books Cassie will be releasing in the future, which is set in the times after TID. Reading about these characters, especially Jamie Herondale, made me intrigued about them, especially since while we've read about the others from TMI and TID, the others we have not much idea about yet. I guess TBC was also a great way to start the buzz on the upcoming series. Cassie succeeded in making her characters vibrant yet intriguing. Above all, I think TBC won't be as exciting as it is to already Shadowhunter readers than to those readers who are new to the Shadow Hunting world. It won't exactly be the right book to begin the Shadowhunter chronicles with, especially since a lot of details in the short stories can and will only be appreciated if you've have understood the context from the first 9 books. Nonetheless, I had so much fun indulging in the different and interesting perspective that is Magnus Bane's. And I'm sure you're bound to have one too.